Right whale in Bay of Fundy. Vineyard is at the southern bound of winter feeding grounds for the critically-endangered whales. Following the sighting of critically endangered right whales last week, the National Oceanographic and Atmospheric Administration has announced a voluntary speed reduction zone for vessels in a large area surrounding the Vineyard and Nantucket. The restriction was to remain in place through Thursday. NOAA Fisheries requested Tuesday that mariners either avoid the speed restriction zone or reduce their speed to 10 knots or less in the areas where “persistent aggregations of right whales” were sighted. The area extends 13 nautical miles southeast of Nantucket, and includes all of Nantucket and most the Vineyard, as well as a portion of the southern cape and Naushon. The following coordinates delineate the restriction area: 41 35N; 40 56N; 069 56W; 070 46W. Right whales migrate seasonally from their breeding grounds off the coast of the southern United States to the plankton-rich waters in New England and Canada, and seasonal management areas in the northeast are maintained roughly from Jan. 1 through July 31. The speed reduction rules, instituted in 2008, are intended to prevent ships from striking the whales. The Vineyard represents the southern bounds of the right whale’s northeast feeding grounds. 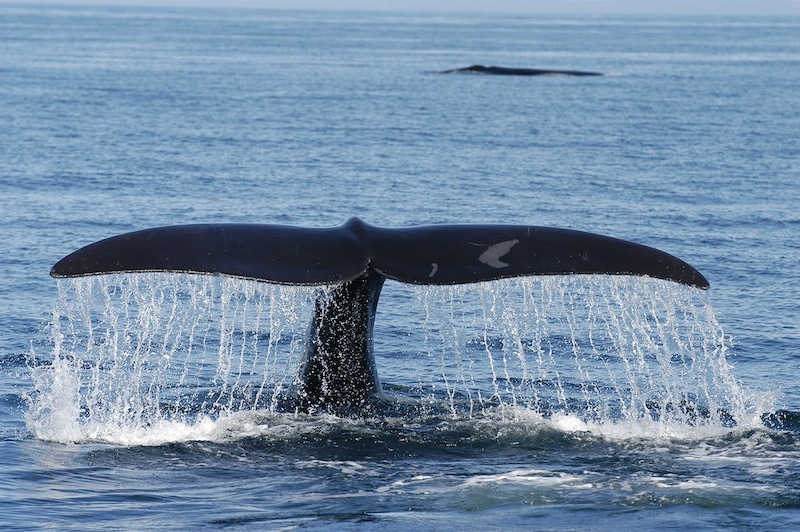 Usually the whales appear in spring and summer and move north toward the Bay of Fundy and Canadian waters by mid-summer. In early summer they are often quite numerous in Cape Cod Bay, where the food source is abundant at that time of year. Mr. Cole said there have been no right whales sighted this season off the coast of Maine, which is unusual. “So there does seem to be a real shift,” he said. A study issued by NOAA this summer found that notifying mariners of the management areas and issuing citations during the seasonal management periods has been effective at preventing collisions with right whales. NOAA scientists reported that they had not seen any right whales that had been struck by ships since the regulation went into effect. Scientists estimate that there are only about 450 right whales alive today. Dr. John Patrick worked to set the identification of a whale skull bone in motion.